I had some very ripe bananas on my counter earlier this week, so I thought I would make up a batch of Banana Bread. 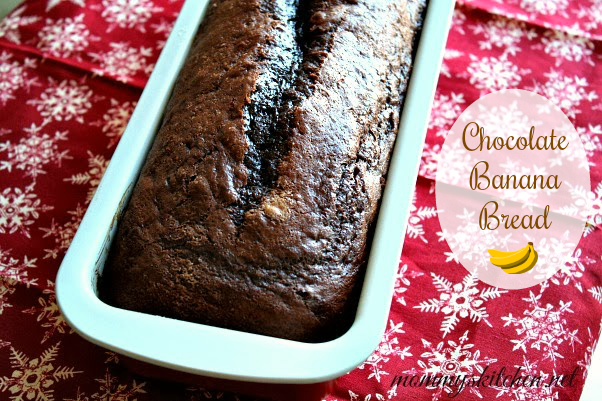 Not just any banana bread, but Chocolate Banana Bread! Lets rewind just a bit shall we, because chocolate banana bread was not my intention. This is just what happens when you don't have a yellow cake mix on hand. A delicious accident if you ask me. My favorite banana bread recipe is one I've been making for over 15 years. I got this recipe from a sweet elderly lady name Ophelia and it's just the best if you ask me, well and Ophelia. Anytime I have very ripe bananas that's the recipe I use. While I was poking around in the pantry I realized I didn't have a yellow cake mix, but I had a box of devils food. I thought to myself how would a chocolate banana bread taste? The combination sounded wonderful to me, so that's what I made. This recipe only has 6 ingredients, so it's really easy to make. It smelled wonderful as it baked and as soon as I pulled it out of the oven I knew this bread wasn't going to disappoint. As soon as the bread cooled down I sampled a slice and it was really moist and delicious. Everyone in my house agreed that this recipe was a hit. If you have some very ripe and browning bananas hanging out on a counter top, go and make this recipe. Chocolate and bananas are the perfect combination. As you can see by the photo above I didn't mash the bananas before adding them into my mixing bowl. The bananas I used were very ripe and very soft. Just using the paddle attachment and the mixing of the batter smashed them up perfectly. I love that this recipe uses just one bowl. For double chocolate goodness you can also sprinkle a few chocolate chips on top before baking. Preheat oven to 350 degrees. Peel and mash bananas and set aside. In a large bowl combine the dry cake mix, eggs, oil and milk. Blend on low speed with a hand mixer or use the paddle attachment to your Kitchen aid mixer. Add mashed bananas and the vanilla extract; mix t combine. Pour the batter into a large loaf pan (2qt or larger) or two smaller loaf pans that have been sprayed with baking spray. If using chocolate chips sprinkle a few on top before baking. Bake for 40 - 45 minutes (depending on your oven and pan size) or until the bread springs back when touched and a toothpick inserted comes out clean. Remove from oven and let cool before serving. Wrap leftovers in plastic wrap. Cook's Note: I used one 12 x 4 x 3 inch loaf pan (2 quart) that I purchased from Ikea. These are my favorite bread pans. I make chocolate banana pudding & we love it . Now that sounds good Loretta. Have never made Chocolate Banana Bread but have added mini chocolate chips to my batter. Your bread looks wonderful and will be making this for sure. Oh, I bet cream cheese would taste good on this. I have 2 bananas in the freezer that should be used so all I need now is the cake mix. I can't wait to make this Tina. YUMM! So glad you shared. Pinning for now. This looks so interesting, not of thought of chocolate but plan on giving it a try. This looks really good. 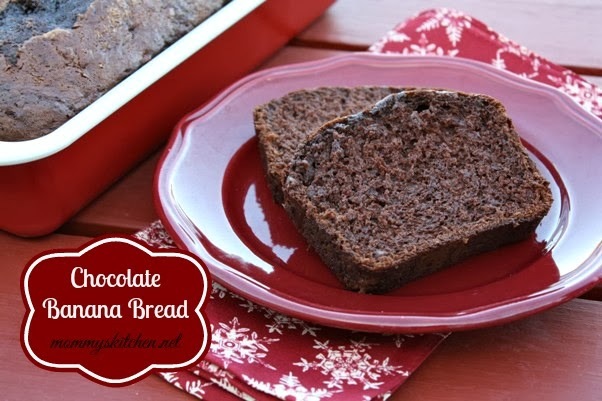 I love banana bread and chocolate so putting them together might be really good. I just verified with someone that the printfriendly button is working. Once you click the red button it will generate your page to print. It isn't going to have the consistency of a bread like yeast bread. Regular banana bread is a quick break like muffins. So this is what the chocolate banana bread is like. I usually put mini chocolate chips in my zucchini bread. So I'm thinking "what would peanut butter chips do for this recipe?" Most folks like PB and banana sandwiches and chocolate and PB always good together. I'm going to give it a shot just to see. This looks awesome! I can imagine my customers at the Farmer's Market would absolutely LOVE this! LOVE the idea!!! Wonder how you would make this without a cake mix, but from scratch. I have never made this without a cake mix, so sorry I cannot help you on that one. Maybe another commenter has a banana bread recipe with chocolate. Oooh, I would love have that recipe. I would love to have this recipe Loretta. Do you it published somewhere? Thank you Tina, for another wonderful use for cake mix. I just recently started making cookies with a cake mix. My family loves them and I love how easy they are. Can't wait to try this. Oh, dear me! Which recipe do I pick? With chocolate cake or yellow cake?? Either way I am sure it will be a winner!! I do have real questions however: have you used this recipe to make muffins? Any changes to the recipe other than length of baking time? How much does it rise? Another keeper.... kids were waiting for the timer to go off to eat them. Put cream cheese on them. Said they r the bomb.. very happy mom from nj..I made them into cupcakes. It made 20 cup cakes. Used my ice cream scoop to measure it out. I made the recipe but didn't mash up the bananas. They look kind of weird...lol. Is that normal when they are not mashed up? Perfect recipe and easy to make. Thanks!